Do you also need certain foods ALWAYS in your house, otherwise you get upset and your whole day is spoiled? I've got two things: milk to put in my coffee in the morning, as I hate black coffee. And apples. I need them. At least one everyday. I have been addicted to them as long as I can remember. In fact, most of the times, I even carry one in my handbag. 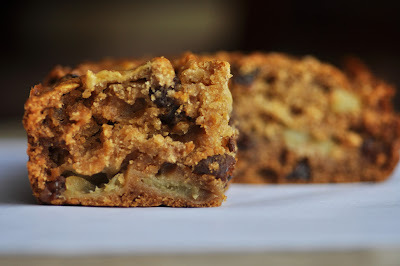 Now, I came across this Chocolate Chip Oatmeal Cake on The English Kitchen blog the other day. The oatmeal in the cake got me going on this. As you might know, I always try and make food a little healthier or, at least, try and reduce the "bad" stuff as much as possible. So I didn't want chocolate chips and refined sugars in my oatmeal cake. I decided to make it a fruity oatmeal cake. First thing, or rather fruit, that came to my mind were of course apples. I tried and replace the sugar by a little agave and naturally sweet raisins. Initially I thought, the cake might need some frosting, but that wasn't necessary. The cake was gone in two days, which is a good sign, as it is only two of us eating it. Preheat oven to 180C. Grease a wide loaf pan or line with parchment paper. In a large bowl, pour boiling water over the quick cooking oats. Make sure you are using the exact measurements. Too much water may spoil the cake. Slice the butter and place on top of the oat water mixture. Let stand for about 10 minutes. In a small bowl, combine the egg and agave syrup. Mix well. Pour over the oat mixture and stir until well combined and butter is fully melted. In another bowl, combine flour, baking soda, cinnamon and salt. Combine wet with dry ingredients and mix well. Stir in the raisins and the apple slices. Pour the batter into the prepared pan. Bake for about 45 minutes or until toothpick comes out clean. Let cool in the pan. Cut into squares to serve.